Peg is the youngest child of a U.S. Navy Commander who served in a variety of military towns in the United States in the 50s and 60s. Military records are available to relatives wishing to discover their family history. I always intended to ask my Dad for the name of the ships where he was stationed during his twenty-four years in the U.S. Navy. Unfortunately, I waited too late. But all was not lost. I found a way to get the official records that would answer my questions and it was surprisingly simple. Who Can Request Naval Records? If you are a veteran or a deceased veteran's next of kin, you can submit a request for records through the National Personnel Records Center. There's no charge for this service and it's remarkably easy whether by mail, fax or online. Growing up as military dependents, our family members were used to getting a crisp salute from the Marines at the gate when we entered any Naval base. Showing our identification cards allowed us access to the Commissary where we bought our household groceries. The Base Exchange (BX) provided many of our back-to-school clothes and we often went to the Saturday matinee on the Navy base where movies were only ten cents. As children, we took Judo Classes on the base and participated in tournaments against other students. 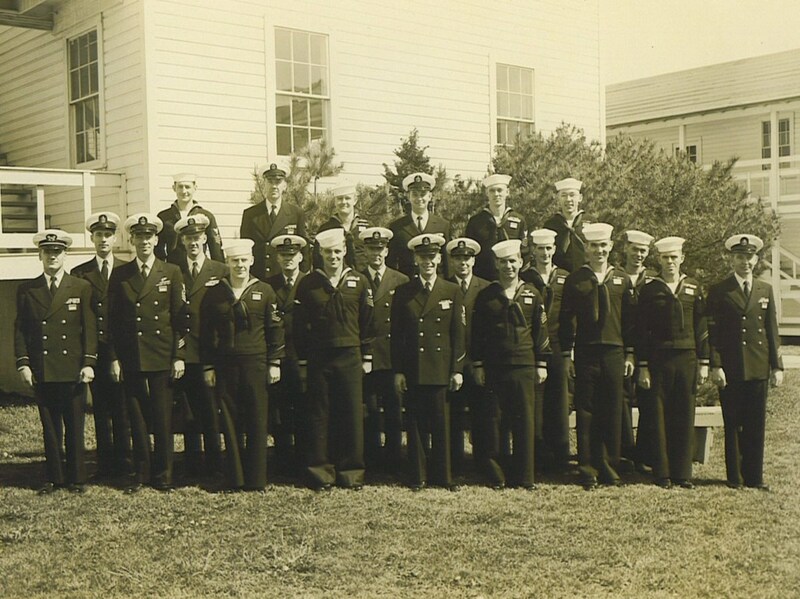 The Navy was our world and most of our friends were also military dependents. During the time spent in the service, the names of ships changed as often as the names of the cities where Dad was stationed. Brooklyn Naval Yard, Key West Naval Station, Charleston, SC, and Norfolk, VA were ports in the short span of a couple of years. Remembering these along with the names of the corresponding ships became hard after years had passed along with my father. 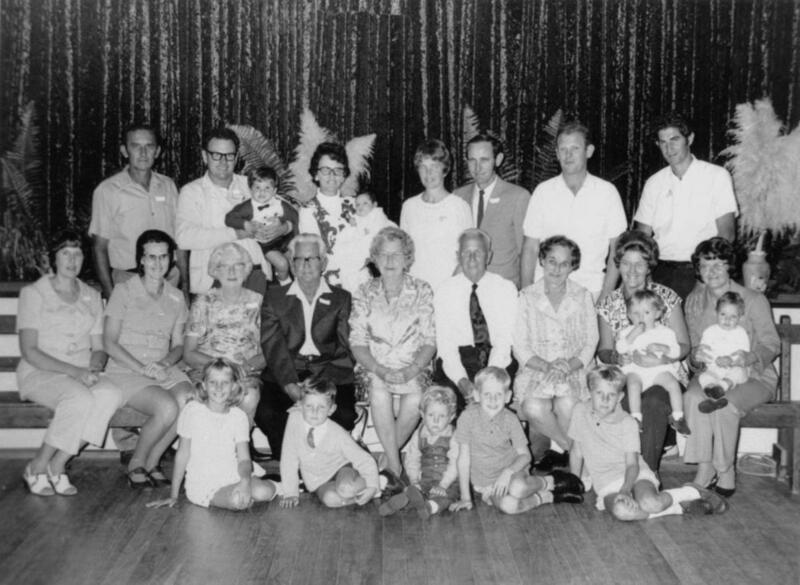 When Dad would talk of his time in the Navy, he would captivate the room with his adventures and narrow escapes. I took notes, but there are gaps that I can no longer fill in with a quick phone call. I wish I'd asked more questions while I still had the opportunity. He's gone now, but not forgotten. Rest in peace, Dad. Finding out more about him through the official records has been an insightful experience that helped me fill in some of those gaps. Personnel records and Service Treatment Records (STR) of military service members who retired, were discharged or died in service over the past sixty-two years are available to the next of kin of the veteran. 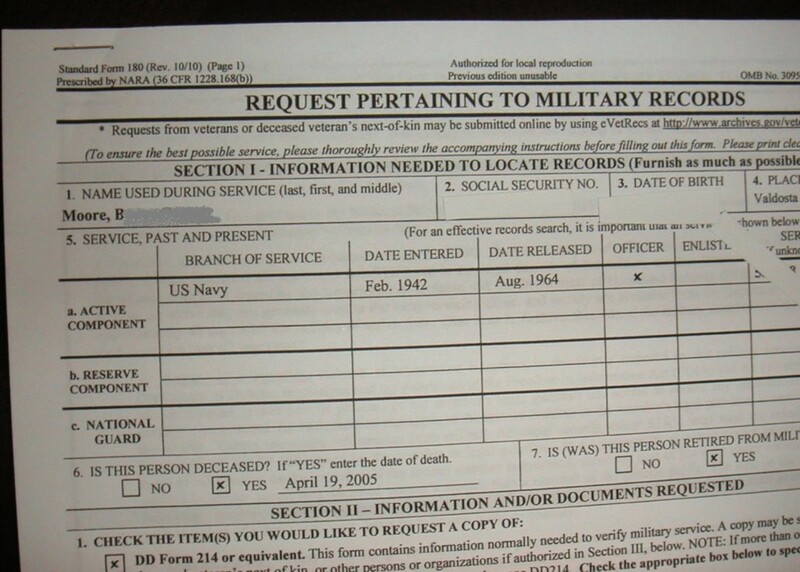 When the Standard Form 180 is submitted to the appropriate agency, depending on the branch of service, it requires only a minimal amount of information to complete the form, including the exact name the veteran used during service, their social security number, date and place of birth, branch of service and date entered and released from military service. The form asks if this person is deceased and the date, and if the person retired from military service. They offer a checklist of items that may be requested, such as a form DD214 (which is the military discharge "Report of Separation from the Armed Forces of the United States"), an important form useful when filing for military benefits and other business. The requester can ask for All Documents in the Official Military Personnel File (OMPF), Medical Records including Service Treatment Records (outpatient), inpatient and dental records. The form does ask your purpose in obtaining these records. Although the answer to this is voluntary, it may result in a "faster reply" when answered. When I submitted my Form 180, I listed my interest in writing a chronology for the veteran's descendants and for publication of stories related to military interest. Your signature is required on the form along with any proof of death, such as a death certificate, and the relationship you have to the military service person, for example, next of kin. In my case, it was as the daughter. I didn't have a copy of the death certificate but they accepted the obituary from the newspaper along with the funeral card showing the birth date and date deceased of the veteran. After making a copy of my request, I mailed it off on March 7, eager for the return of my packet. I called to follow up on the request on March 25th and spoke with an efficient, well-informed staff member who found my request quickly and let me know they were "working on it" pending copies of certain documents. He let me know I should expect to receive something by the middle of April. The manila envelope marked Official Business came from the National Personnel Records Center in St. Louis, arriving in remarkable time just thirty days after my request was mailed. It included a list of decorations, medals, badges, commendations and campaign ribbons that he was awarded. There were records indicating his pay scale, ports of duty, dates he took leave and even the service training he completed. Copies of his enlistment papers listed classes he took in high school and which sports he played written in his own hand. I'm still discovering interesting facts about my father's military service from the documents I received. If you're a historian or just fascinated with the details of your parent's military service, requesting this information for your veteran is highly recommended. Follow the link to the National Personnel Records Center to begin your quest. I wish you all the best in your search to find out more about your family history. My wife is almost finished with a (surprise) Quilt of Valor to give to an old friend that served in the Navy from 1967-1970 in Vietnam. She would like to put a label on the back with his actual ship and the date it was presented to him. We have asked his wife to try to get this information (in casual conversation) for us, but she has not been able to get it. Is there a way that we can get this info online? What a nice tribute to your friend that served in Vietnam. Please thank him for his service to our country when you see him. The link above requires that a direct relative seek the information you need. Perhaps you can include the veteran's wife in your surprise and ask her to get the information for you. Can you please direct me towards someone to help locate my father? With some basic information about your father, you can find out where he served during his time in the service. Start with the Standard Form 180 and fill in as much information as possible, then, submit it online. Several questions come to mind about your quest: Is your father living? Do you know his military service number? Do you know his place of birth? Do you know in which branch of the military he served and when? In addition to the online form to request military records, you might Google the name(s) of any ships where he was stationed. The online administrator can direct you to personnel lists. Do you know any duty stations where someone might remember him? Perhaps they have a list of assigned personnel by year. Another option is to Google the online site for National Archives where they have a "Contact Us" option. How do I find someone if I don't have the information needed to find military service records? According to this website, http://www.dd214.us/methods.html, the best method to get the separation papers for your veteran is write to the NPRC or National Personnel Records Center and explain the circumstances of your request. The DD214 Separation Form will provide much of the info needed to file a Standard Form 180. The site also gives several options for obtaining this information including the use of paid researchers. Hello Patrick, So sorry to hear about your brother. May he rest in peace. There are several sources for locating records. Especially with the Discharge Certificate you would have his essential dates and service numbers. Under the link for the National Archives there is a page called Locations of Service Records which gives several more links to branches of service including US Army Human Resources Command and active and non-active duty National Guard. Hi Toni Lowry, I wish for you success in your quest. Hopefully you have some of the basic information about him to help in your search. Dear Wilton, You'll definitely need to find out his social security number or service number or dates of service from his discharge papers (DD214) or inquire at https://www.archives.gov/veterans/military-service... about her options. This may start the process out for your Mom. My dad was in the Koran my mom doesn't know his social security number she needs his ss number so she can get some benefits his name is Wilton touchton,sr born live oak fla 19?? Can you please help me? Hello Shaun, If you Google The National Records Center St Louis you will see a phone number listed. I hope they will be able to guide you in providing the information needed to locate his records. 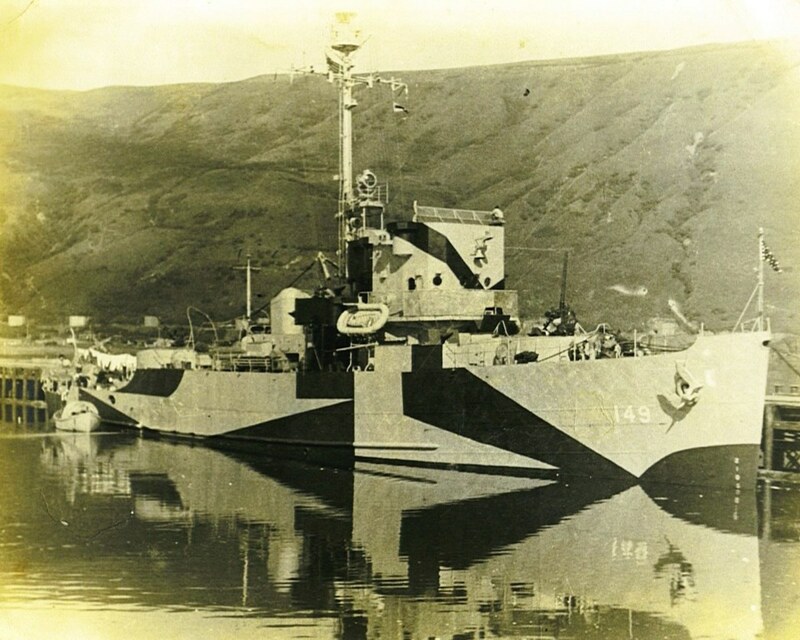 All I would like to know is which LST my grandfather served on during WWII. How would I go about doing that? He passed away in 2013. Thank you. Hi Eloise, Sometimes you can check with the admin for the ships where your husband served. They may have a crew member photo on file. Search on Google for the name of the ship, then follow the links to the ship's page. Best of luck in finding what you need. I have all information and would like a picture of my husband showing him in his Navy Uniform for a tribute in our local newspaper. How can I obtain this information? Thanks for any help. Sherry, I'm sorry you've had difficulty in locating your father's records. 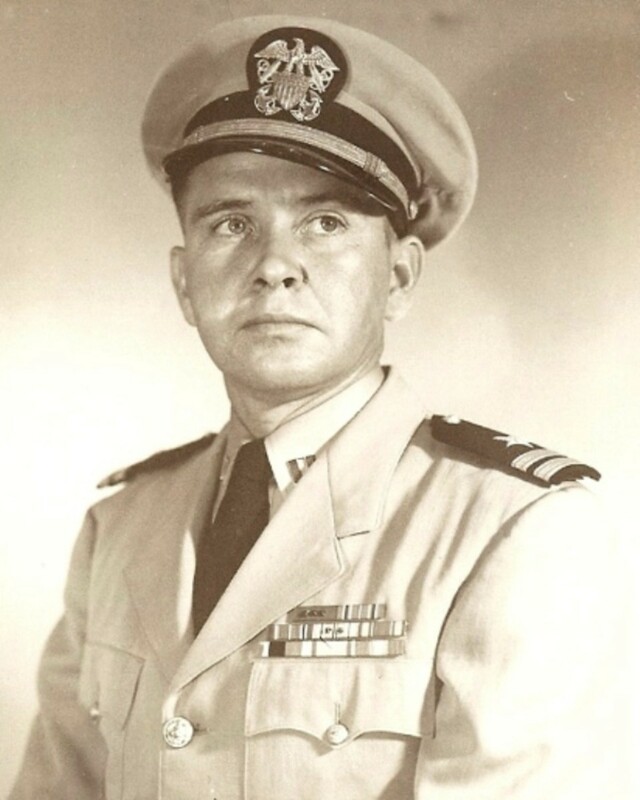 The only ideas I have are to ask relatives for more information and also look through old photos and paperwork to get insight into his duty stations, service number, social security number or the names of ships where he served. There are groups online for many of the ships and once you locate a name, they may have crew lists of their personnel. You can follow the trail from there. 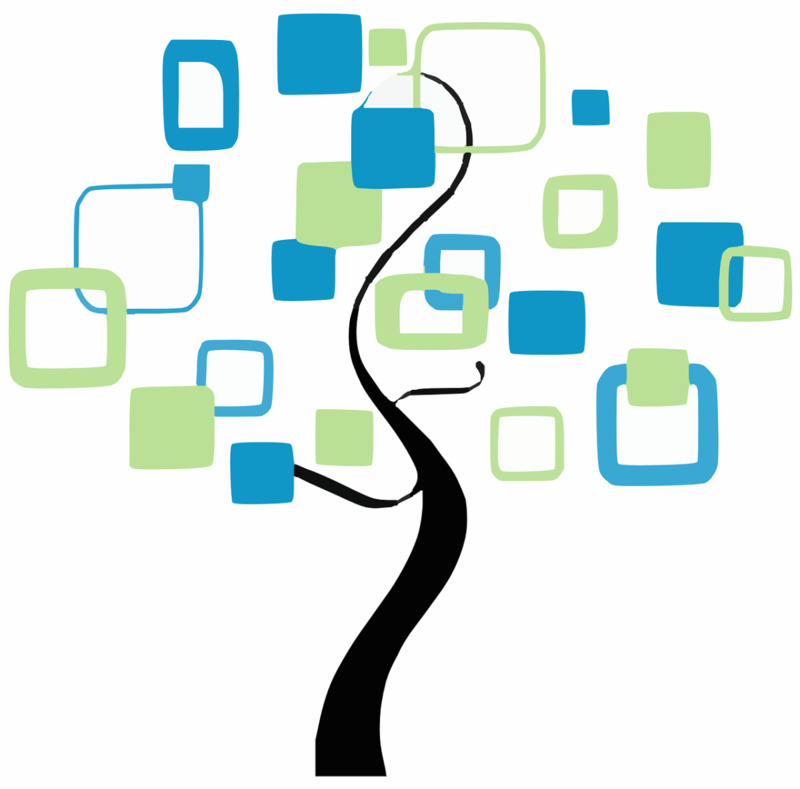 You could also try a historical search of the family on one of the genealogy sites. Best of luck to you in your quest. Thank you for stopping in, Anonymous. I'm glad you found the information useful. Peg, thank you for this valuable information, I hope to find the time to do some research in near future. Dear Michelle, Thank you for the email. I'm so sorry for the loss of your dad. That's so hard to process.There are many questions we wish we could have asked them. Since you are a direct descendant, you should be able to obtain his military records. Try to locate his social security number and the years when he served if you can and submit a Standard Form 180 to the address in the link above. Hopefully they can help you. Thanks to your dad and to so many others who served our country when called. Hello Trisha, Thanks for the email telling me about your Great Uncle Joseph. If you'll follow the links in this article to the agencies where service records are kept, they may be able to help you find a bit more information on your relative. I admire your interest in honoring his memory and service. Hi Carl, Thanks for stopping in. Dear Captain Lukas W. R, Thanks for your email question regarding the soldier you met who fought at Iwo Jima. Honoring this man at a Parris Island graduation would be a fine tribute. I would recommend that you contact the Customer Service Center at the National Archives, 1 866 272 6272 and explain your intentions and need for details on this veteran. Due to HIPA and other privacy acts it may be tough to get his personal information unless you go through a relative who is next of kin to the veteran. Thank you sir, for your service. Hello Sean, I would recommend asking his wife (next of kin) to request the military records. You can help her fill out the online form and submit it. When the records arrive they should list his ribbons, medals and awards received to help you with your shadow box creation. What a great idea to pay tribute to his service! Thank you for your service in the army and to your uncle for serving as well. 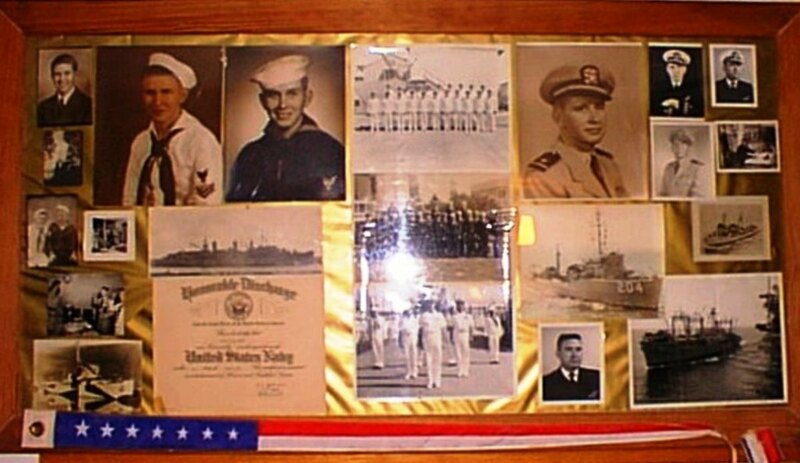 I’m trying to make my uncle an I love me shadow box of his ribbons and rank and such with a few pictures of his ship. I’m curious if I’m able to request the forms? I’m also a veteran that served in the army. He’s not deceased, and I’m not his next of kin. Should I have my aunt ( his wife ) do it? Would she be able to get the records if I’m not able? He’s not able to remember all of the ribbons and such he’d had while serving. He also has nothing left of it as it was stolen when his house was broke into tens of years ago. Thanks. Thanks for coming by, Kenneth, and the best of luck in finding the records for your dad. It truly is eye-opening to discover things that you never knew about a loved one. For example, I found out my dad was captain of his football team in high school. I never knew that! Anyhow, thanks for the visit. This hub is just what I needed. I am going to my local Vets Administration Office and see the people in that office about securing my dad's service records. Peg, thank you for writing this hub. Matt, as an afterthought, several years ago I corresponded with a shipmate of my Dad's that I found after signing up for notifications under the specific ship's name. Perhaps some of your Dad's friends could provide additional information for your quest. It's worth a try. Dear Matt, In answer to your email, the records that are available from National Personnel Records only tell destinations, ship names, dates of leave and other general information rather than identify specific duties undertaken while on station. I'm sorry I can't be of more help. There are so many things I wish I had asked my own Dad while there was still time. Dear Edna W, You are a valuable person who, I'm sure, has a lot going for them regardless of whether you knew the birth parents that brought you into the world or not. It seems like it was his loss not to get a chance to know, love and cherish you. I will hope for you to find your true purpose and your finest talents will shine. God Bless you. Dear Tina N, My heart goes out to you in your situation. It is difficult at best to find a birth parent without a good deal of information. I'm not familiar with any organizations that can help you locate someone with only a photo of them. Maybe one day that will be possible. All the best to you in your quest. I do wish I could help you. So sorry this happened to you. May God bless you and keep you safe. Hi am trying to find my father who was in the Navy i was born in 1959, he went by the name of Chico, he meet my mom in the L.A area a place call wilmington ca. I just need to know where i belong i feel lost and empty because i feel my whole life been a lie. Hello Jackson, It's great that you know about your grandpa's military service aboard the USS Rich. Well done. 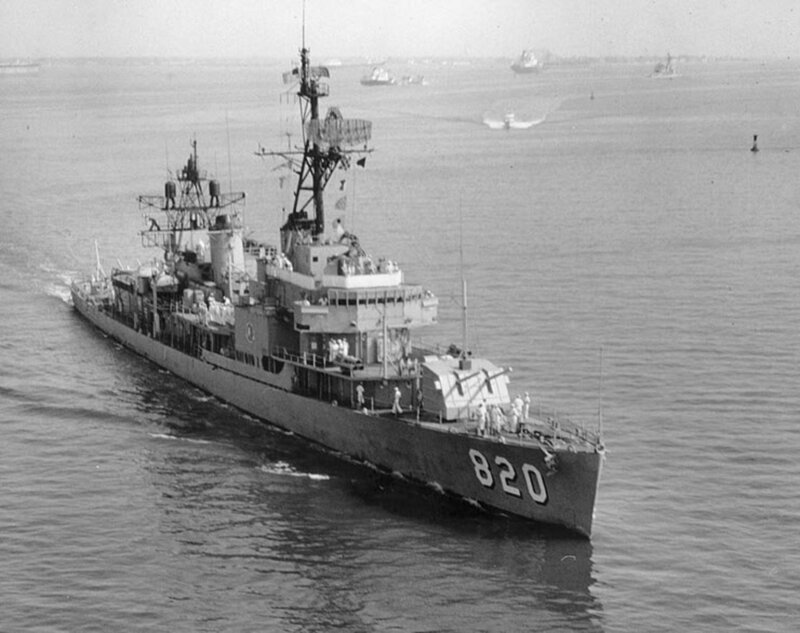 We were living in Key West Florida during the Cuban Missile Crisis and my dad was stationed on the Naval Base there. We watched a convoy of military vehicles come into the city. It took hours for them all to drive past there were so many. Hello Mary, Thanks to your dad for his military service and to you for stopping by to check this out. I was pleased to get the package from the official records and to learn many new things about my dad. This is interesting info. I am sure many descendants of service people would be happy to know more. My father served in WW2 and would be happy to know more. Hello Ashley, It's sad to hear that your father and you don't have a relationship. My dad and I had a couple of years when we didn't speak then I finally realized he wouldn't be around forever and he was, after all, my dad, for better or worse. I hope you will reconcile your differences and ask him for the truth directly. As a direct dependent you can gain military records if you can provide his service number and other pertinent data. The link is shown in the article. All the best to you in your quest. I hope that you get the answers you need. 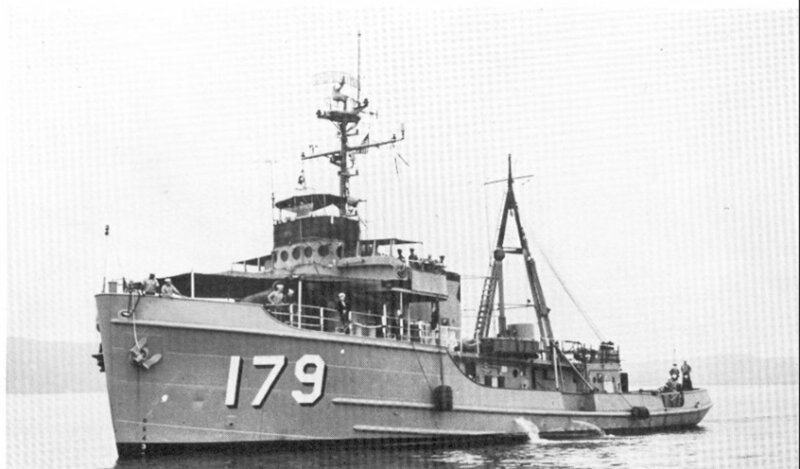 My bio father, a real piece of work, says he was honorably discharged from the navy back in Vietnam. My family says he was in fact dishonorably discharged. My father and I never had a relationship, but I would like to know the truth. As far as I know he's still alive, but again we don't speak, how do I find out the truth? Thanks very much.. Much easier to lose them tho than see them go thru so much and have no life afterward. I always think if you set them free they choose their desires themselves. Thanks again for your help and God Bless you and yours. Dear Judy, I'm so sorry I couldn't be of more help. You have my deepest condolences on the loss of your brother. The day we put them to rest is one of the hardest days. May God bless you and your family at this time of grief. Thank you very much for answering me. We are running out of time finding the information. Funeral is tomorrow. No closer for the military funeral tho. Hello Judy, Your brother and my dad likely served in the same waters watching the same sunsets. Thanks for stopping in and best of luck on your search. My brother was Charles Blake Farley Jr. he was in the Navy in the 50s. He was on the Ship USS CharlesHRoan. On Sep 1 2017 he died. We cannot find his Service number is there a way for us to get it? Thanks so much Ms. Cole for posting this information. My father was also in the Navy during WWII and I have long wanted to have his records. He worked on the floating drydocks in the Admiralty Islands where he was on and involved in the repair of so many ships of that day. He has also passed away and these records will now be my only chance to get more of the detailed info and always wondered just how to go about the process. Again Thanks, Charlene K.
Hi Joe, Thank you for stopping in here and for the nice remarks. Your visit encouraged me to revise this article and add some new photos. I really appreciate your encouragement. Best of luck in finding your historical info. I had never thought about some of the things you recommend, and I'm HUGE into documenting my family history. Thanks for the information! Hello Anne, Thank you for stopping in and for commenting. I had to delete your comment unfortunately since it led to an outside link. I'll try to include a link to the SF 180 form within my text. Again, thank you for the visit. Hi Cogerson. I hope your brother will be able to find out the history on your grandfather and solve some of the family mysteries. It really is fascinating to find out stuff about our ancestors. I was lucky to have the basic information I needed to begin. Too bad much of it is missing from further back in the family history. One of my great uncles served in the Confederate Army from what I was told. Thank you for the kind words and votes on this hub and all the best to you in your search. Great information in this hub. My grandfather served during World War 2.....and he is almost a mystery to the family as he passed away during the war and my father never got the chance to know him....I am sharing this with my brother who is always looking for information on our family. 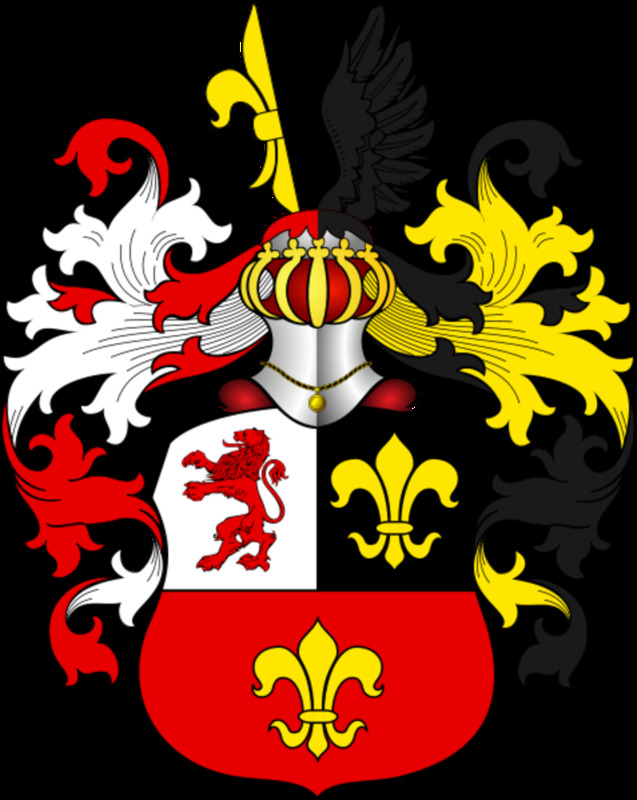 I think it is very fascinating to trace your family history....voted up and very interesting. Hi Jason, Thank you for stopping by and for leaving such a nice comment. Wow, this is really incredible. Thanks for sharing! Hello and thank you for the visit here along with the kind comments. I hope others have the same good fortune in finding out about their family's military history through this method. Thank you Ggent001. I was really pleased that this process worked for me. You've shared a good clue for those with more difficult cases. Nice to see you here and thanks for the additional help. Hello Brenda, Where would this information be kept for example on the public records? If you know the state where he went to high school you might start there with an on line inquiry. I didn't have this issue since I already knew the SS#. That really helped. Would you be able to look up income tax records on line that would have his SS#? As next of kin they might release it to you upon direct inquiry. Or you might write to the Bureau of Records at the link above. All the best to you in your search. I was very young when my father passed away and it seems no one has the info I need to acquire the service information. How do I obtain my fathers SS# and/or service record #? I used to know this. My mother and father divorced when i was very small and she has no interest in helping me. Thanks in advance. Hello Shiningirisheyes and I'm so glad to meet you here. What a great piece of history you have with those taped conversations you made of your Dad. So much of what their lives were like and what they went through can be remembered now. All the best to you in finding the records you seek. Thanks so much for your visit and votes! Thanks for that additional tip on finding crew members and such on line. I believe there's a link on this hub that takes you to one of the ships on which my Dad served as a plank officer; The USS Rich. There is a write up of his service and a memorial tribute written following his passing. I have neglected to do any further investigation on the other ships that I learned about via this method. Guess it is time to get back on that project. Requesting civil war records is an excellent idea and I must someday delve into that, as one of Dad's ancestors served as an officer. So much fun when the records arrive, reading and learning. Thanks for stopping in to share more ways that we can unravel the mystery of our ancestors. Peg, you don't mention it, but once you know the ships a relative served on, the internet is a great place for additional information. 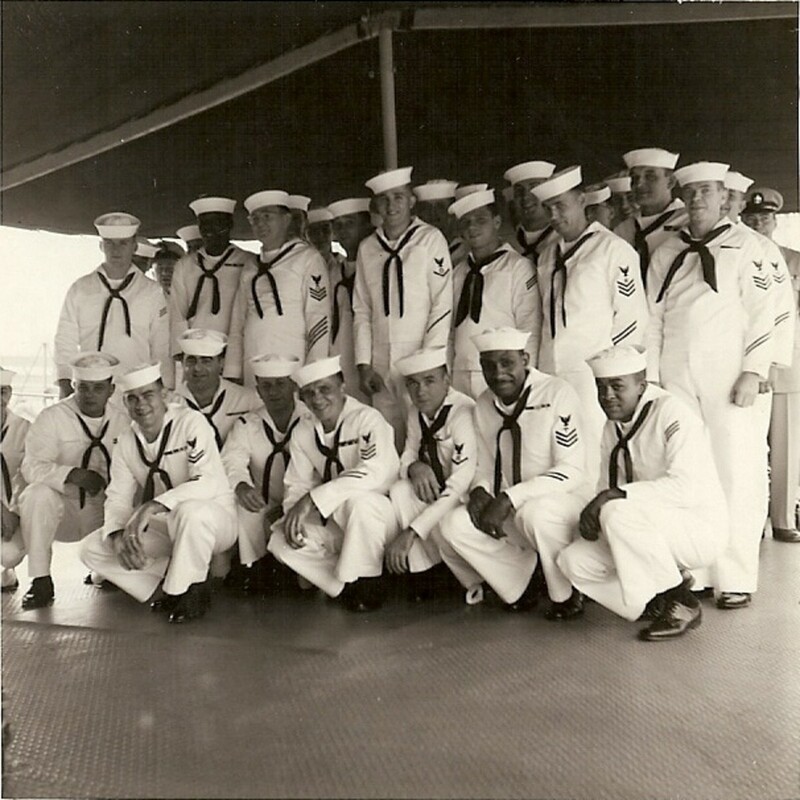 Photos of each ship, for one, but also online accounts of crew members who served on them. Many times, these will include details of battles and such that never appeared in the "official" records. My dad never served in the military, but I AM familiar with the excitement you felt on receiving your dad's records when I received the Civil War (and pension) recs of some of my ancestors. Here, too, it's extremely important to specify "ALL records". The photos are great to have and even better with the details that will come in answer to your request. Inside the package I received were "leave records" so I knew what time frames for which ships based on these dates. All the best in your research and thanks for stopping in to comment. Hope you'll let me know how it goes. Thanks so much for writing this article. My father was a Navy medic in the South Pacific during WWII. I have a lot of photographs, but very little information about the ships. I'm going to follow the steps you've outlined and see what I can find. Hello Peg. I am sure your poetry is beautiful. Mr. popularity, if they only knew who funny that is. Hi there Mck. Wow, you've become Mr. Popularity. Wooooo. I'm honored to see your note here. Really. I've been working on a little poem today. We'll see if I have the courage to publish it eh? Good to see you. This is great information. A friend's father was a pilot and died in a non-war crash. She has very little info about him and this will make her so happy. Oh, thank you for your great research and for sharing it in a Hub. Great information wish I had thought of it. I sent for my Dad's military records last year. I do genealogy so it really helped me to get his information. Voted up from one military brat to another. PegCole17 the records we sent for with the information you provided arrived, in just under two weeks. I wanted to thank you again. Hi ethel, Thank you for stopping by and for commenting. Hi Jo_Goldsmith11, Thank you. Finding the time to research is difficult and yet it offers the pleasure of personal discovery. I believe each person gets something different out of fact finding missions with their family history. Even looking through old pictures creates a certain feeling about our ancestors and their lives. Really great history you have found! I think this is something you could start up for folks to come to you, after you do all the work researching! Take care..
Epigramman, Having recently discovered your writings, I look forward to learning more about you and reading your Dad's story as well. I find that kind of history truly fascinating. And, btw, you are the great hubber e-man, not me. Hello writeronline, I'm so glad you decided to stop by and leave a comment here. Your mention of a heroic rescue is timely as I have just found a clipping of a news article from the 60s about my own Dad. You are so right about getting that story written, sooner rather than later. I'm hopeful these records will help me fill in the blanks in my sketchy notes. And the process of writing is truly cathartic as you mentioned. It's so nice to meet you here, and having read a little about you, I look forward to reading much more. Again, thanks so much for your kind words and thoughtful comments. ..what a lovely and most interesting story you have presented us here ...... and one in which I can relate - you see my dad (and best friend) was a veteran of World War II as a Canadian soldier for over 6 years and he even wrote a memoir of his experiences and in civilian life he was quite the historian of not just 'his' war but of all wars and history in general - so yes this wonderful story of 'yours' made me think and it moved me and touched me too - so nice to meet up with you here at the Hub - thank you for your nice endorsement of my humble little hubspace and coming from such a great hubber like you that is really quite a compliment indeed. Sangre, Hi. Thank you for your very nice comments. Truly I was pleased and surprised at the way my request was handled. b. Malin, I'm hopeful that others will find this information helpful. And thanks, your compliment is very, very sweet. He was rather dashing in his uniform, at least, I always thought so. Sister that - Again, thank you so very much for the positive reinforcement and helpful link. Nice to meet you also PegCole17. My brother is the awesome writer and I do the family genealogy. Thank you for your kind words. Easy to see why you have hundreds of "followers". :) Take Care and keep up the good work(s). Sister that, How nice to meet you. I'm so thankful your brother shared the link with you. Thanks so much for relaying your success in ordering your Dad's records and for providing another resource for others like us who are gathering up clues. You are awesome! I look forward to reading more about you. Hello there A.A. Zavala, Good point, using the info to research survivor benefits. It is important to find out what's available. Thanks for adding that note and for your nice comments. Hi Lynda, I just found out something new about you. Didn't know you had a connection to the navy. Then you've lived the life of a military dependent as well. In one of my other lives I was an Air Force wife. It is good to see you here today - I've missed you lately. Lynn, my friend, so nice to see you again. Thanks for the nice comment and for sharing my joy! CWanamaker, Yes, really do able. I could barely believe it was that simple. Pamela99 Hi! So good to see you again. I seem to remember that you have done a lot of research in ancestry. Thanks for the nice comments here. What a helpful hub. Not being from the US, I won't be able to put it to direct use; but it makes me think there are likely to be similar records kept by other countries....my Dad served in the New Zealand Navy during WW2, but never really opened up about it; he was involved in one heroic incident that was reported in the local paper, and his sister kept the clipping, so growing up, I did get to see that. Using your terrific advice I was able to go online today and order military records for my Dad. Use this link at eVetRecs at http://www.archives.gov/veterans/evetrecs/. Request must be signed and can be faxed or mailed. Expect a 90 day turn around. Thanks again. Wonderful Hub with lots of useful information. It probably will help a lot of people. Thanks for sharing...You Dad was quite a Handsome man, you make him proud. Thats an amazing story and it's a useful hub for anyone who is looking for the same type of information, it's great they were so organised and able to give you the info you requested. Thank you for posting this valuable information PegCole17 and to Mck for forwarding me the link. Hey there Susan, Isn't it great to discover stuff about your Dad that you never knew? This morning on the Today show, Maria Schriver interviewed a lady who wrote a book about her Dad, after discovering a suitcase filled with his Military items. She reconnected with her father who suffered from PTSD after years apart. Fascinating story. I hope one day to write about my Dad too. Hello WillStar, Great to see you again and congrats to your wife's cousin on the Captain's status. Quite an accomplishment! Mckbirdbks, Hey there. Thanks for sending the link to your sister, the historian. I hope she will find the records she needs! Nice to see you today and thanks for the nice message recently. I've been thinking a lot about Dad recently. Thanks for your kind words. Outstanding hub. A good way to determine if there are survivor benefits available for surviving dependents as well. Thank you for sharing. This is a terrific hub that I'm sure will help a lot of people. As I have been tracing my ancestry for about 20 years I so appreciate tips from people that help fill in those holes in their lives. What you are doing is creating a legacy that will pass on to your children and their children and so on. Great information and rated up. I didn't realize it would so easy to figure things out. Thanks for the information. That is soooo cool and wonderful!! Totally interesting and yet another way to gather history. love it. My Dad served in the Canadian Navy and after he passed I wrote to Ottawa and got all of his records. I actually found out some pretty interesting stuff about my Dad that he had never told me about through the records. Awesome Hub! Well, this is really interesting. Our family historian is my older sister and I am going to send her a link to your Hub. Thank you this information is so valuable. You've made your Dad even more proud of you! One of my wife's cousins just made Navy Captain.